Muscle imbalances are a common cause of injuries and easily preventable. Similar to needing a balance between stress and relaxation, we need a balance between the muscle groups throughout our body in order to function at our maximal capacity and avoid problems. Each sport requires certain muscles to dominate more than others, but everyone still requires a balance amongst all our muscles for them to perform optimally and together as a unit. When we move, no muscle works independently all by itself. Our muscles will also compensate when another isn't working properly. Most of the muscles in our body have an opposing muscle that performs the opposite action. While one muscle contracts, the other muscle relaxes and lengthens and vice versa. We call these muscle pairs agonist and antagonists. For example, we have the biceps in the front of our upper arm and the triceps in the back of our upper arm. When you bend your elbow, the biceps contracts and the triceps relax/lengthen. When you straighten your elbow, the triceps contract and the biceps relax/lengthen. These pairs need similar strength and flexibility levels in order to work best together. If your biceps is too tight, you can't straighten your arm out all the way to utilize the triceps. If biceps is too strong, it will pull your shoulder forward and create posture problems as well as shoulder pain. There are many more examples throughout the body, but here we will focus on an important muscle pair in the legs: the hamstrings and quads. 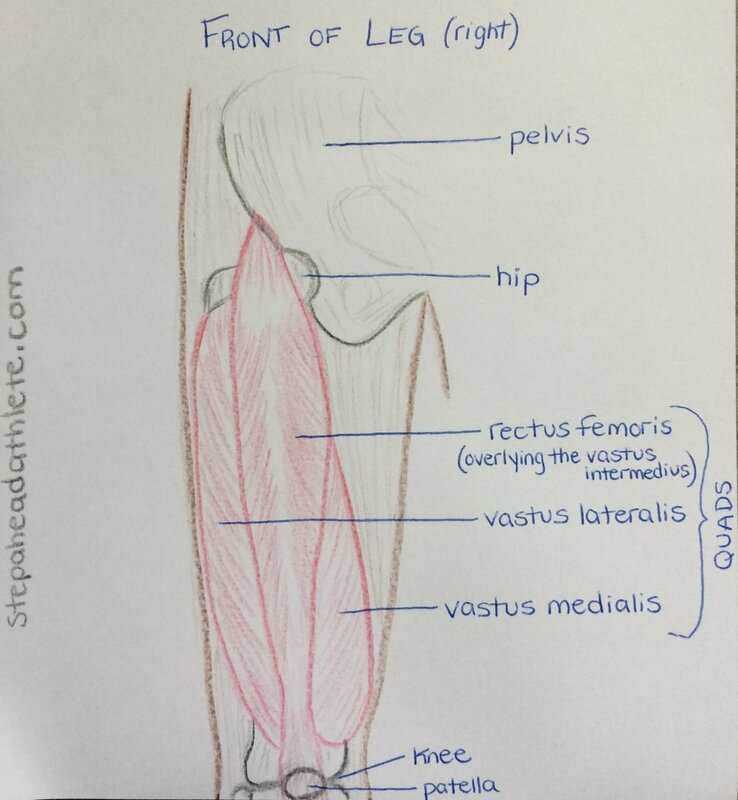 The quads are in the front of the upper leg and comprised of four muscles. The hamstrings are in the back of the upper leg and comprised of three muscles. The quads and hamstrings oppose each other - as you straighten your knee, your quads contract and your hamstrings lengthen. As you bend your knee, the hamstrings contract and the quads lengthen. Most people have dominant muscles in the front of their legs (i.e. quads) and weak muscles in the back of their legs (i.e. hamstrings). This can be somewhat attributed to the fact that many people sit much of the day causing the muscles in the front of the leg to become tight/short and the muscles in the back of the leg to become weak. This imbalance can cause knee pain, low back pain, hamstring strains, IT band syndrome, ACL tears, and much more. In fact, many ACL tears are associated with weak hamstrings, especially in females. As you can see below, the quads and hamstrings pass over the hip and knee as well as alongside the IT band. The hamstring:quad strength ratio is a number comparing how strong the two muscle groups are compared to each other. Ideally this ratio should be at least 60%. Unfortunately many people have a ratio of less than 50%, meaning the hamstrings are only half as strong as the quads. Many surgeons often do not let athletes return to sport after an ACL injury until their hamstrings have a certain level of strength to protect the knee. 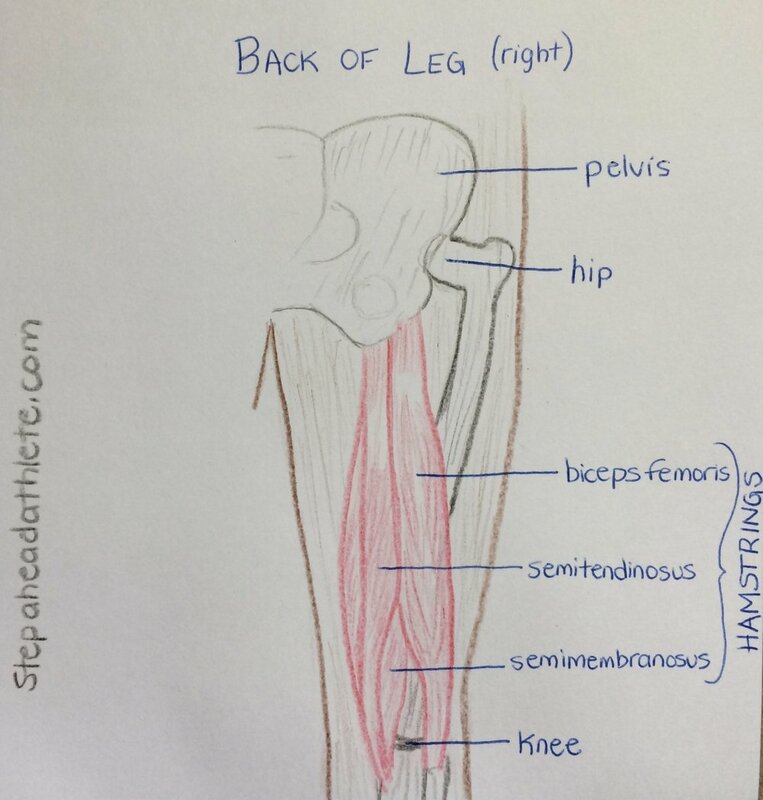 It is difficult to self determine the amount of quad/hamstring imbalance in your own body, but try to think about which of your muscles are usually the tightest and which muscles are usually the most sore after a hard workout. Do you sit a lot throughout the day? The front of your hips are probably tight. Do you hyperextend your knees? Your hamstrings are probably weak. I used to have quad dominance and over stretched hamstrings, but a focus on hamstring strengthening has corrected this problem. Some of my favorite hamstring strengthening exercises are shown below including bridges and hamstring curls. You can also simply push the back of your heel into a chair leg when sitting to activate the hamstrings. Put your fingers behind your knee to feel the hamstring tendons tighten. If you feel you need to strengthen your quads, try squats (double and single leg), lunges (forward and backwards and sideways), and single leg planks. You can even just straighten your knee out and focus on tightening the thigh/quad muscles to get them to activate. 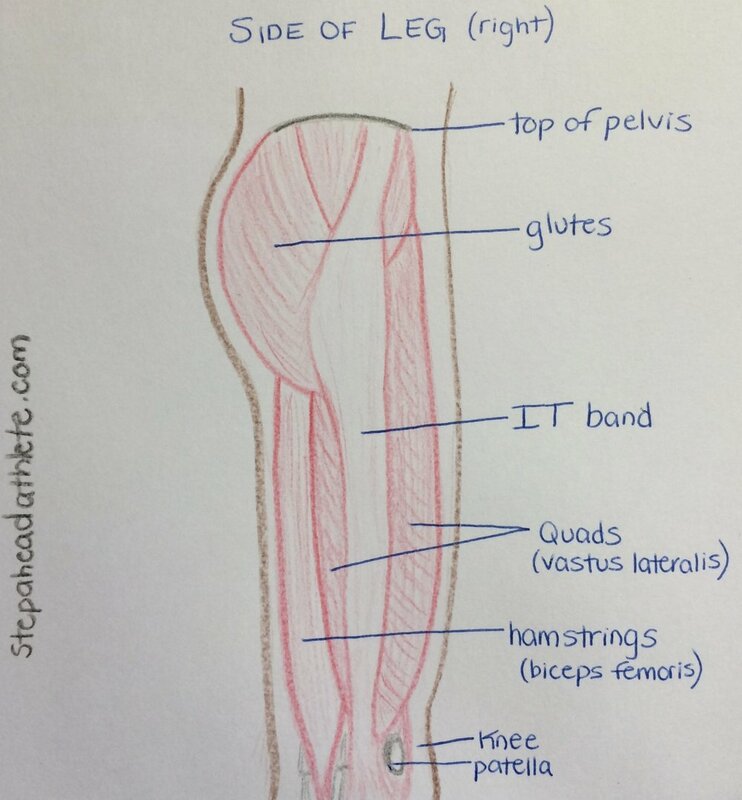 The vastus medialis, or inner quad, is usually the weakest and the vastus lateralis often dominates. Make sure the vestus medialis is contacting with the others by using your fingers to feel for it (see the image above - it is located just above and to the inside of your knee cap). Don't forget to foam roll and stretch to maintain flexibility as well. If you experience pain with any exercise, stop - try to correct your form (a mirror can help with this - look for symmetry) or swap the exercise out for something different. There is no one size fits all exercise and we are meant to move in a variety of ways, so it's good to mix things up!